Over the last week I’ve produced this season’s first set of club-by-club attack breakdowns, which are explained in full here but in a nutshell compare the quality of chances that players are getting on the end of with their scoring rate. I tend to get asked two questions about these: firstly, can they be overlaid and secondly “where is Player [X]” when someone who’s scored a few goals misses the cut (usually because of a lack of minutes played). 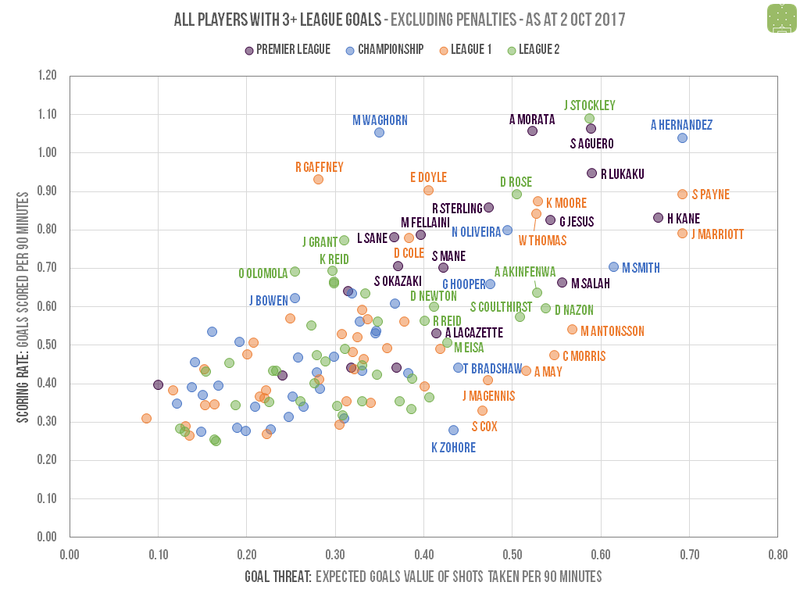 This is obviously far from rigorously scientific, but it’s interesting to see that Jayden Stockley has been doing for Exeter pretty much what Sergio Aguero has done for Man City, while both Shrewsbury’s Stefan Payne and Peterborough’s Jack Marriott can lay claim to being League 1’s Harry Kane. I’m also happy to be the first person in history to highlight any similarity between Kieffer Moore and Gabriel Jesus. If there are any players you’re looking for but can’t see, the best bet is to check the individual club versions of these charts in the first link at the top of this post.